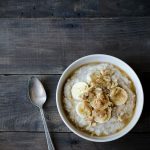 Banana Millet Breakfast Porridge is like healthy banana bread in a bowl! It’s an easy, gluten-free breakfast that the whole family will love. The first chapter of my book is complete! When I first began the process I swore to myself that I’d still keep up with 2-3 blog posts per week but as you may have noticed, I have not been keeping that promise to myself. It just hasn’t been realistic. Writing a book has been so much more work than I thought it would be. As with the blog, it’s the writing I’m really struggling with right now. The introductions. I’m just not that good at inserting my personality into little paragraphs about frittatas and cake. It always feels very forced to me. The recipes and the photos are looking pretty great, if I’m allowed to toot my own horn. I just need to figure out this next piece of the puzzle. And while I’m doing so, please enjoy this banana millet breakfast porridge. It’s kind of like a healthy, gluten-free banana bread in a bowl. Banana Millet Breakfast Porridge is like healthy banana bread in a bowl! It's an easy, gluten-free breakfast that the whole family will love. Bring 2 cups of water to a boil in medium saucepan. Add the millet and salt. Cover, reduce the heat to low and cook for 35 minutes or until the water is absorbed and the millet is soft. Stir in the milk, ground cinnamon and maple syrup, adjusting the seasonings to taste. Divide into serving bowls. Top each bowl with sliced bananas, walnuts and, if desired, a bit more cinnamon and maple syrup. I like using a 1/2 teaspoon kosher salt, but the results are bordering on salty when you taste the millet by itself. The porridge tastes very balanced when you eat everything in one bite - the millet balances nicely against the sweetness of the banana/maple and the bitterness of the walnuts. You may want to start with 1/4 teaspoon and add the rest at the end if you think it needs it. This porridge looks so comforting, Jennifer! I completely understand how you feel about the writing – if I could just cook and photograph and not type or say a word, life would be pretty darn great :) I can’t wait to see your book, I’m positive it will be wonderful! This looks so delicious. I’m not a huge breakfast person, but in the winter I do love some warm porridge. And high five for getting the first chapter out of the way! The fact that you have time to blog at all is great considering how much work the book is! I actually started with a lot of the writing because I knew it could be the most difficult part for me for sure and it helped to ease me into that transition. Girl I am sure the photos are fantastic. This definitely looks amazing. Writing a book is hard so know that what you are doing is admirable. This I can go for this anytime. I love millet. And the book – thats alot of hardwork!! I’m with you, I can cook all day but it’s sitting down to write the intro where I struggle. I just want to say “JUST PUT THIS IN YOUR FACE ALREADY! !” But I can’t wait for your book! If I could say that for every post and every book intro, I’d be set. That’s all I want to say! Congrats on finishing that first chapter! Now hurry up with the rest…I can’t wait! ;) This is my kind of breakfast…especially on cold mornings, I’d love a warm bowl of this millet! I actually bought some millet and love it! It’s got a real nutty flavor and a nicer texture than oatmeal. I love the texture as well! It reminds me of cornmeal. Definitely more exciting than oatmeal. The manuscript is due in September, no official release date yet. I’d imagine sometime in mid (early?) 2016. I SO know what you mean! I just wrapped up and sent in my first draft to my editor the beginning of February and by the end of January I felt the SAME exact way. My brain was in overload and I struggled too with finding what to say about certain recipes. Hang in there and congrats on the book! Ps… this millet porridge looks fab! Thank you! I never realized the writing part would be this stressful. Gah. Banana bread in a bowl sounds pretty delicious to me! Good luck with your book! 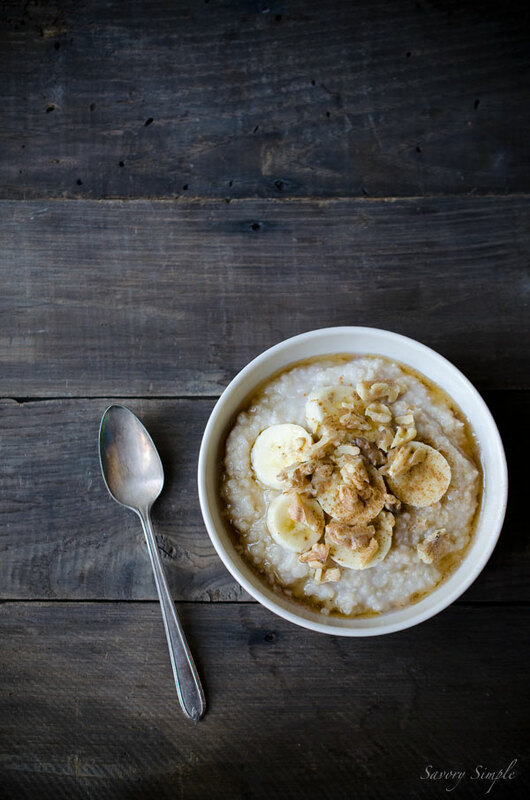 love adding bananas to porridge or oatmeal. Such a wonderful flavor and texture combination. I just made this porridge and wanted to let you know that these quantities barely made 3 portions. Also, it was really too salty, so we had to add lots of honey to hide the taste (we chose to use honey instead of maple syrup). Anyway just wanted to let you know in case you need to adjust the recipe. Thanks! Thanks for commenting! I’m so sorry the recipe didn’t work out for you. Salt and serving sizes are always the trickiest part of any recipe since they’re a bit subjective. What’s overly salty to one person might be perfect to the next, or vice versa. Same with serving sizes. I think my husband would consider one serving of pasta to be at least double (if not more) of what I consider to be one serving. Regardless, if you do make this again I would just season to taste and double the recipe. Thanks and happy new year!